March 22, 2016 - Ninety female missileers made Air Force history today as the first all-female missile alert crews to serve on alert at three intercontinental ballistic missile wings simultaneously. In honor of Women's History Month, missileers based out of Minot Air Force Base, North Dakota; F.E. Warren AFB, Wyoming; and Malmstrom AFB, Montana, completed a 24-hour alert shift to sustain an active alert status of the nation's ICBM force. A missile combat crew (MCC), is a team of highly trained specialists, often called Missileers, manning Intermediate Range and Intercontinental ballistic missile systems (IRBMs and ICBMs, respectively). "The goal of this day was to highlight all the women who worked hard to make a difference in public service and government jobs in the past," said Col. Stacy Huser, the 91st Missile Wing Operations Group commander at Minot AFB. "We honored those women who have worked to gain opportunities and disavow stereotypes when they began their careers. This day was our tribute to them, as well as to inspire future generations of women to work in public service." According to the U.S. Census Bureau, women make up almost 51 percent of the nation's population. Women currently make up 19 percent of the Air Force, the highest percentage of any service. Goodwin flew as aircraft commander for one of the B-52s alongside six other women. In total, 14 women whose ranks range from lieutenant to colonel flew in the bomber formation, serving in the roles of pilot, weapons system officer and electronic warfare officer. 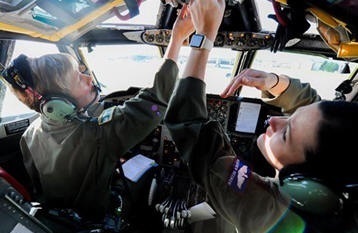 "To carry on the legacy of women in the Air Force is very special to me," said 1st Lt. Elizabeth Guidara, the 12th Missile Squadron combat crew deputy director at Malmstrom AFB. "Not being afraid to take risks and taking ahold of those opportunities that present themselves are two things that I've learned to live by throughout my career."